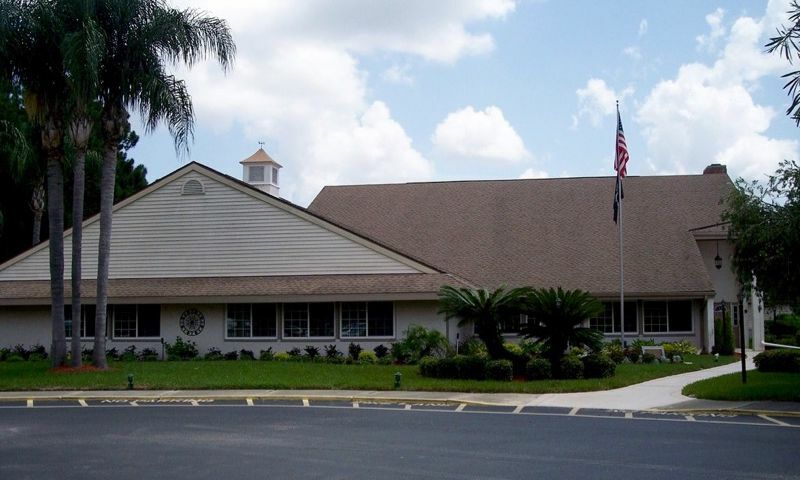 Heritage Lake is a 55+ community located in New Port Richey, Florida. This age-restricted community features great amenities, affordable low-maintenance homes, and a social environment that caters to active adults and retirees. Heritage Lake offers home-buyers a quiet setting with 932 residences located within a lush landscape of scenic lakes and ponds. Residents of Heritage Lake enjoy living in a prime location within the Tampa Bay area that's close to shopping, dining, medical facilities, and plenty of attractions. All of the physical and social activity takes place at the Heritage Lake clubhouse. Residents enjoy a myriad of fun things to do inside and outside of the clubhouse. Homeowners can dance the night away in the ballroom. Neighbors can mingle over a game of billiards or cards in their designated rooms. They can also enjoy quiet time with their favorite book at the library. A catering kitchen is also available to residents so they can prepare snacks for parties or special events. Heritage Lake homeowners can take advantage of the outdoor amenities as well. They can swim a few laps in the pool or soak in the adjacent spa. Residents can relax on the patio to enjoy the Florida sunshine or enjoy the scenic views from the gazebo. Active adults can challenge friends to a tennis, bocce ball, or shuffleboard match at one of the many courts on site. Residents have access to a boat dock in Heritage Lake where they can enjoy a variety of water activities. Walking and biking trails, as well as scenic lakes and ponds, surround this charming 55+ community. Heritage Lake was developed between 1981 and 1994 and consists of 585 residences. Active adults can choose from resale attached villas and single-family homes in a variety of styles that meet their needs. These affordable homes offer one-story living, spacious floor plans, plenty of storage space, and charming patios. Heritage Lake offers 55+ homebuyers attached villas that range in size from approximately 962 to 2,168 square feet. They typically have two bedrooms, two bathrooms, and an attached one-car garage. Active adults who want more space can opt for a detached home. These single-family homes usually range from 922 to 2,307 square feet of living space. They have two or three bedrooms, two or two-and-a-half bathrooms, and an attached one or two-car garage. An established homeowners' association (HOA) handles most of the exterior-home maintenance. HOA fees vary between single-family homes and attached villas. An HOA fee may include cable, common grounds maintenance, roof repair, security, trash removal, and pest control. Heritage Lake provides a socially engaging environment for 55+ homeowners. Residents can participate in a variety of activities and events in the community. They can join card parties, pancake breakfasts, or exercise groups. Neighbors can share similar interests by getting involved in the wine club. Active adults can also start their own tennis or bocce ball leagues as well as organized community events with other residents to enjoy all that Heritage Lake has to offer. Heritage Lake is located in Pasco County near many attractions, shopping, dining, and medical facilities as well as the Trinity area. Residents can shop at Walmart, Target, Walgreens, and Publix Super Market. There are plenty of chain restaurants as well as fast food establishments just a few minutes away. Homeowners have access to a variety of medical facilities including Trinity Health Center, Apollo Medical Center, and Medical Center of Trinity. Residents can visit beautiful beaches along the Gulf Coast as well as golf courses in the area like Fox Hollow Golf Club and The Eagles Golf Club. The city of Tampa, as well as the Tampa Bay International Airport, is conveniently located about 30 minutes away. Active adults will love living in Heritage Lake because of the affordable homes, social activities and resort-style amenities in a prime location in New Port Richey, Florida. There are plenty of activities available in Heritage Lake. Here is a sample of some of the clubs, activities and classes offered here. Heritage Lake offers 55+ homebuyers attached villas that range in size from approximately 962 to 2,168 square feet. They typically have two bedrooms, two bathrooms, and an attached one-car garage. Please Note: Floor plans are not available at this time. Single-family homes usually range from 922 to 2,307 square feet of living space. They have two or three bedrooms, two or two-and-a-half bathrooms, and an attached one or two-car garage. Please Note: Floor plans are not available at this time. Ammenities are nice but most of the residents are not grandkid friendly. 55places.com is not affiliated with the developer(s) or homeowners association of Heritage Lake. The information you submit is distributed to a 55places.com Partner Agent, who is a licensed real estate agent. The information regarding Heritage Lake has not been verified or approved by the developer or homeowners association. Please verify all information prior to purchasing. 55places.com is not responsible for any errors regarding the information displayed on this website.